By considering two truths of Buddha-dharma, it becomes obvious that one who does not value the practice of loving kindness is creating circumstances for unhappiness. The first of these two truths states that all that arises dependent on conditions is impermanent. The second calls to mind the inevitability of cause and effect. All compounded things, all relative existence, whatever exists in time, is impermanent. All that we get or refuse to get, keep or refuse to keep, try to make ourselves into or refuse to acknowledge – all relationship is subject to change. Because the conditions that support manifestation do not stay put, everything is in flux. Because it is difficult to continuously be aware of impermanence, people tend to downplay the importance of motive in favour of striving for worldly satisfaction. This continuous desire for what one doesn’t have causes much unnecessary suffering. We think there is something to get that will make everything all right. We buy lottery tickets while ignoring the prize we’ve already won. Even spiritual practice can become a struggle to get something other than what is present. Or keep something from dissolving. Or keep away from something we deem as unworthy. And yet there is no lasting value in positions or things, because they are all in the process of passing away. For every gathering there is a dispersal. For every building there is a ruin. For every meeting there is a parting. For every birth there is a death. Although whatever comes into being is subject to dissolution, the motives or intentions continue to have power. The opening statement of the Dhammapada (sometimes called the verses of the law) clearly proclaims this truth. I will quote from a translation by Shri Silananda Brahmachari. As a seed bears fruit when suitable conditions are met, so a deed yields results that reflect intention. In the above quotation, mental factors refer to the part played by consciousness when the sense doors come in contact with their respective objects: eye and form, ear and sound, and so forth. In this case, the mental factors are equivalent to perception. The sense doors meet with an object, which stimulates the part of consciousness that is linked to that sense. Immediately there arises a feeling of pleasure or non pleasure, which is coupled to a mental feeling of pleasure, non-pleasure or neutrality. It is on the basis of this that perception will arise. Regardless of the physical feeling, if the mental feeling is tainted with greed, hatred, delusion, pride, or jealousy (called by the Tibetans the five poisons), it is very likely that an action motivated by these painful states will occur. When this happens, the consequence is suffering. Should the consciousness be motivated by devotion, non-clinging, loving-kindness, compassion and the like, then – as inevitably as a shadow follow one – happiness results. Whatever is arising is due to past cause. We have no power to influence it. Whatever will arise is due to present motive. In every moment we have the power of choice. The practice of loving-kindness is one of the excellent tools to train the mind to move in the way of joy, choosing to live each moment with an open heart. When one practices honesty – that is, accepting what is present – and develops a habit of investigating what is given freely without mental revulsion, happiness will grow. The best of all true things is a true heart. Cecilie Kwiat was born Novernber 1, 1939, and raised in Alberta, Canada. For the past 35 years Cecilie has been actively involved with alleviating emotional suffering in herself and others. 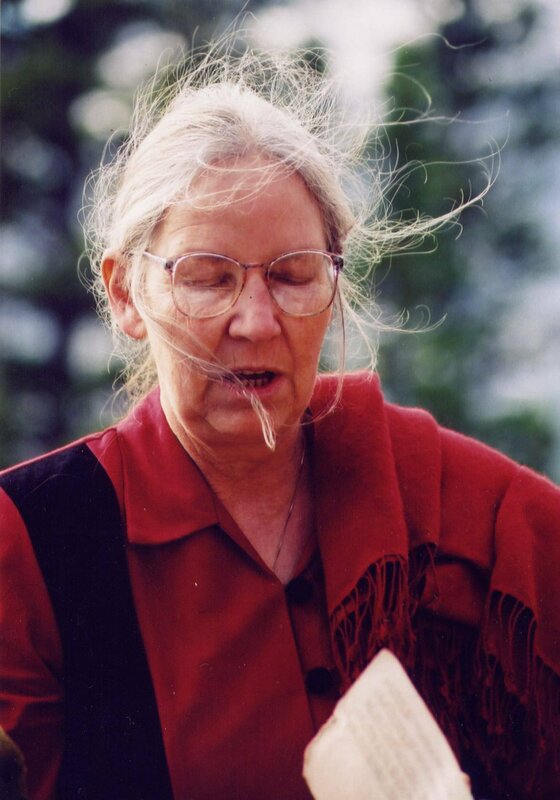 In addition to her investigations and sharing of Eastern and Western spiritual traditions, Cecilie is a poet and a member of the performance poetry trio “Uncritical Mass”. Banner image from Cecilie’s 75th Birthday Party at the Dharma Centre of Canada, just after she taught a retreat there, shortly before she passed away. Photo taken by Natalie Karneef. Individual photo of Cecilie used by permission from the Open Path, Boise, Idaho.